This week, I made one of our favourite easiest, summer lunches while taking a quick break from gardening: a Mint Omelette. I make it often in summer (totally copied from Antoine’s Corsican mum) to help contain our friendly-but-proliferating mint varieties, as it makes a deliciously refreshing dish, served with plenty of fresh, crusty baguette. Well, it’s a change from Mojito Macarons. Yes, there is. 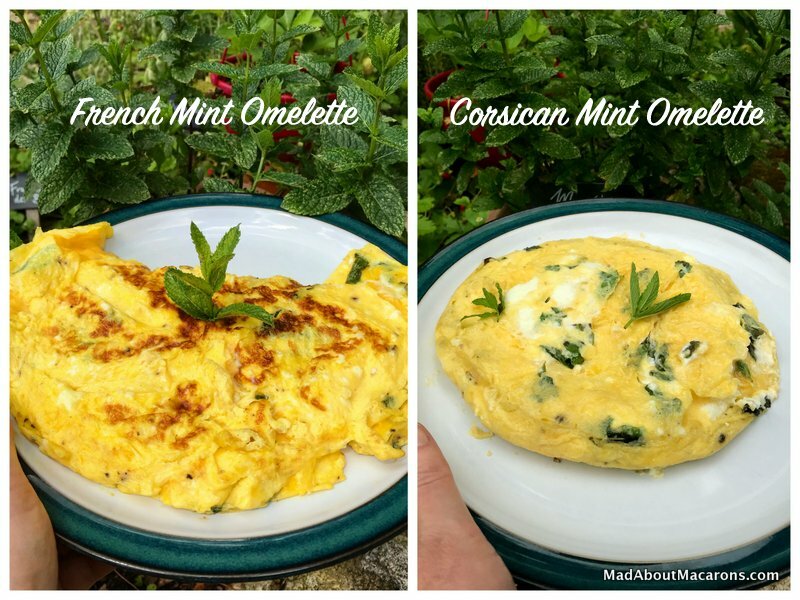 My mother-in-law always makes it just with mint – but there are two versions to a Corsican Mint Omelette: one is with mint, the other with mint and cheese. However, I didn’t tell you the best part about a Corsican omelette. Firstly let me tell you, if you’re new here, that my husband is Corsican. He’s from l’Ile de Beauté, the beautiful island that sits southeast of France’s hexagone and above the Italian island of Sardinia. While Corsica has officially been part of France since 1768, its culture is still predominantly Italian. It’s fascinating listening to my mother-in-law speak the Corsican language with her neighbours, with its Italian and French lilts. 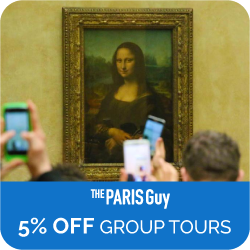 To give you an example, bonjour is bonghjornu and au revoir is avvèdeci. Admittedly, I’m too shy to attempt the lingo, as there’s a particular accent that sets the Corsicans apart – you could say it sets their ‘bones apart’ (Sorry, couldn’t resist an awful pun, as Napoleon Bonaparte was born here). My only two words are va bè (ça va), said slowly with a positive shoulder-shrugging gesture that probably says, “I may sound ridiculous but yes, everything is cool here”. Two-thirds of the island is dramatic mountains with perched hilltop villages, which influences Corsica’s cuisine. Although fresh fish and seafood are popular in the touristy coastal resorts, inland there’s trout from the rivers – always served simply – but good, rustic food from the land features most. Corsicans love their meat (namely lamb, boar and lots of veal: try this Corsican Veal and Peppers recipe here), their own cheeses (notably brocciu – read more here in my recipe post for Fiadone, Corsican Cheesecake), vegetables and wild herbs from the unique maquis, the most unmistakably Corsican fragrance of the surrounding shrublands. 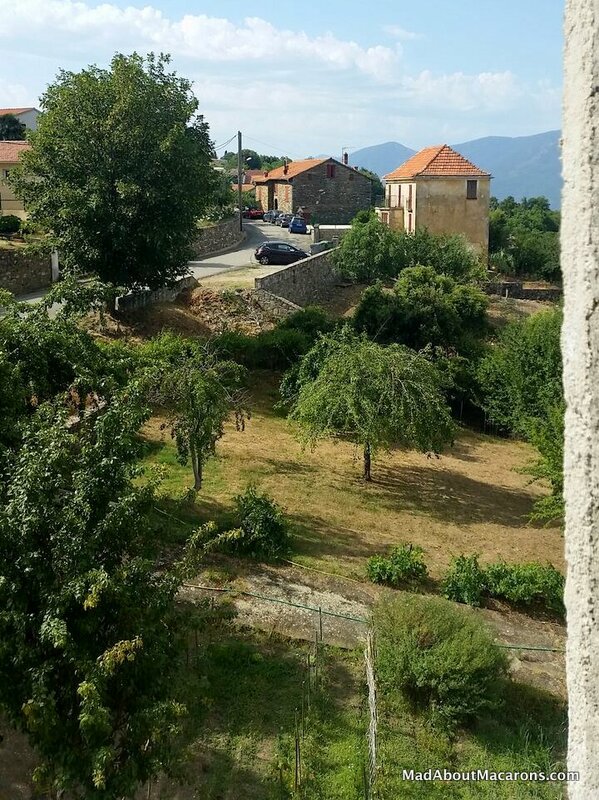 Antoine’s family hilltop village is nearest the mountain town of Corte. Homegrown vegetables and herbs are in nearly all of the villagers’ gardens and, while there are plenty of dishes I could cite here, let’s focus on mint – otherwise I can feel the next book coming on. I left the best for last. So, what makes a Corsican omelette different to a regular French omelette? 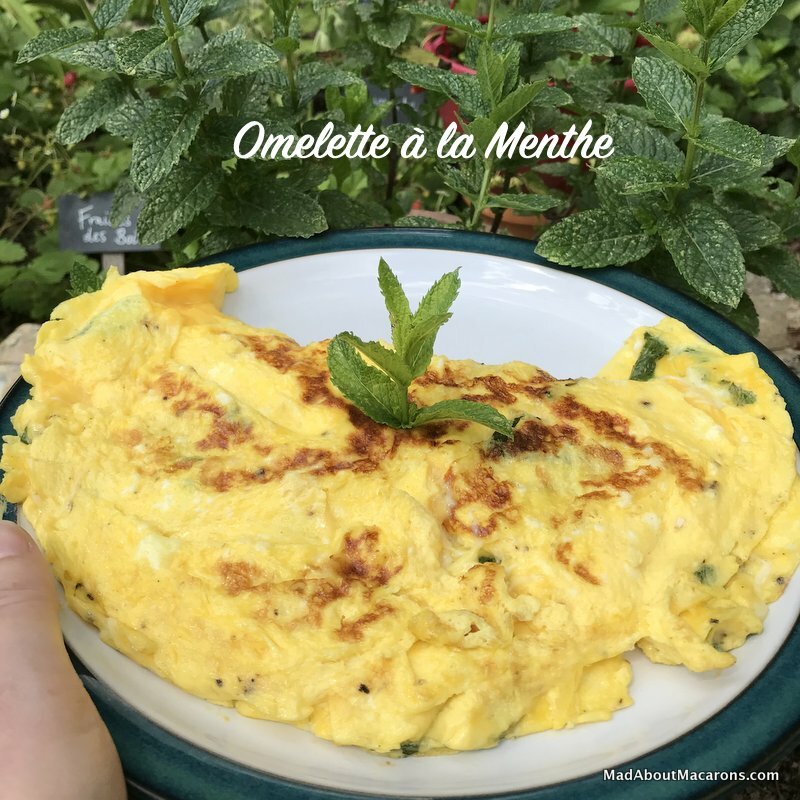 Corsican omelettes are made using olive oil and, instead of being folded or rolled over, they are served flat – cooked more underneath and just a quick minute more on the facing side. As with the regular omelette, it’s still deliciously runny inside; as the French say, it’s an Omelette Baveuse – literally dribbling. Traditionally, brocciu cheese is often added to a mint omelette – but as it’s difficult to find (often expensive) and not widely available during the summer months (it’s normally produced between November to June, when the milk is at its richest – otherwise it’s known as ‘brousse’ if it’s not 40% fat by AOC standards), we need an alternative. A Corsican chef told me to use la Faisselle in France, which is good, but I believe the best substitute for brocciu is a good quality, soft fresh goat’s cheese – although a good, salty ricotta cheese also works well. 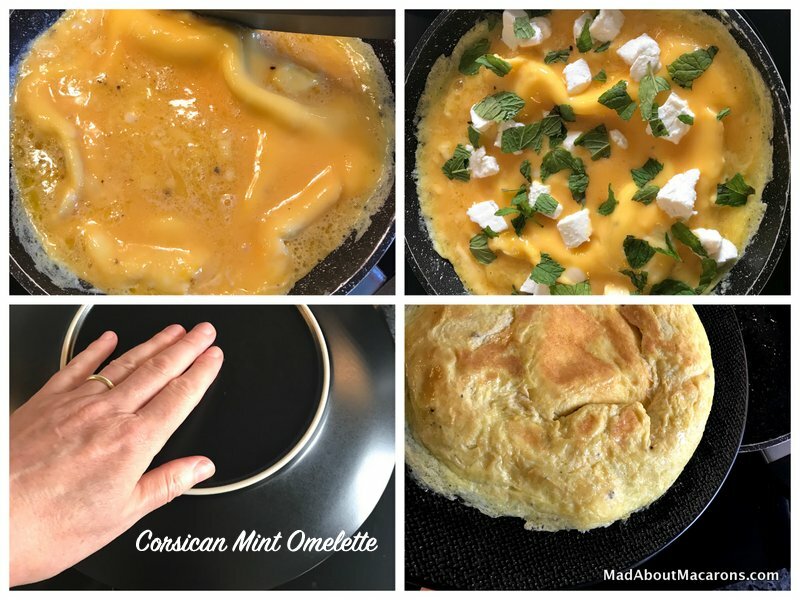 A simple omelette dish, popular in Corsica made with mint and often includes Brocciu cheese. If you can't find fresh Brocciu, a good fresh goat's cheese or ricotta is excellent. Heat the olive oil in a non-stick omelette pan over a medium heat. In a large bowl, beat the eggs just until the eggs and whites are mixed together. Add the salt and pepper, according to taste. Tip the egg mixture into the pan with the hot oil. As the eggs cook, quickly move around the mixture away from the sides, tilting the pan so that the liquid from the middle goes all around the outside, to enable more even cooking. Top evenly with the mint and cheese (if using) and, while still a bit liquid, top with a large plate and tip the omelette onto the plate. Carefully, slide the omelette back into the pan, cooking the other side just for a minute then serve the omelette with the least cooked side upright. The omelette should be soft and runny in the middle ("baveuse" or dribbling, as the French say). Corsican omelettes are served flat and not folded over like French omelettes. It doesn't matter if the omelette isn't coloured - just ensure the eggs are cooked but the omelette is still a bit runny or baveuse. 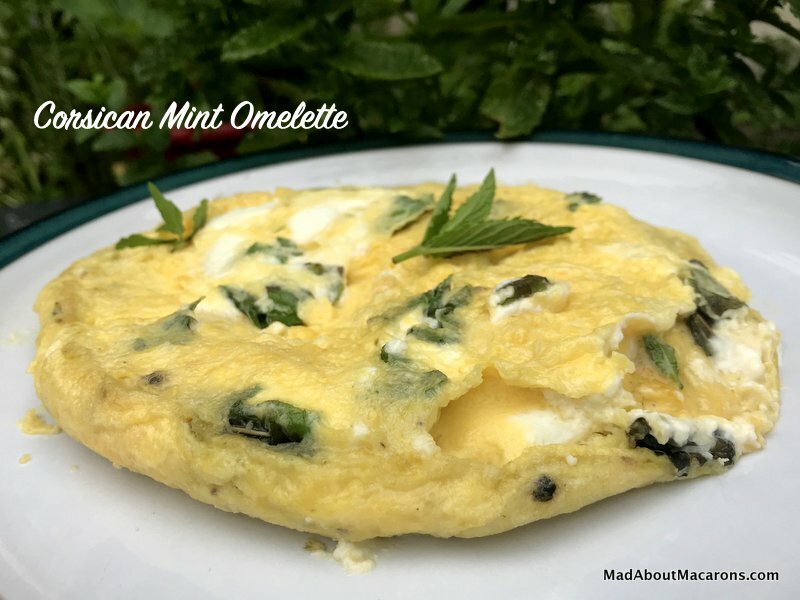 Have you made any of the recipes from le blog or fancy making this Mint Omelette recipe? Please leave a comment below (it motivates me to continue posting here) or take a picture and hashtag it #MadAboutMacarons. I love to see your creations on Instagram and Facebook. Thanks so much for popping in! I was scared to make this classic French Crème Caramel for many years after my arrival in France. Instead, I sat back and let my French mother-in-law make her delectable family-sized version each time we visited them in their pretty Provençal village of Saignon. Back in Paris, I’d order it hands down each time it was on the dessert menu in brasseries, bistros or cafés. Somehow that pristine dark caramel reflecting our wide, greedy eyes looked so perfect yet was so light that I thought it was a no-go to make. French Crème Caramel seemed so simple but it was totally out of my comfort zone. French Crème Caramel – a classic favourite! Growing up in Scotland, we made ours using a green-boxed packet mix: my job was to squeeze out each sachet of caramel into each dish and excitingly, the whole thing worked just beautifully. 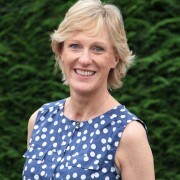 Many years on, I cringe at packet mixes but then it’s an entirely different era; now we prefer to make dishes from scratch – as we know exactly what’s in it, can lower sugar levels and add our own creative twists. This classic French dessert can easily take on many twists – as the likes of teas, herbs, and floral infusions work well while infusing in the milk. I’ve made this with jasmine tea, Earl Grey tea and fresh or dried lemon verbena (incidentally, have you tried this lemon verbena ice cream?). They’re all fantastic – but I keep referring back to the good old classic vanilla. There’s something so nostalgic about it, isn’t there? Fresh berries or exotic fruits on the side are enough for me. Simple yet effective. Over the years, I prefer this version, as I’ve experimented making Crème Caramel with cream, milk and cream, milk and eggs but in the end, this is by far my favourite: just with milk but the addition of 3 egg yolks gives it that creamy melt-in-the-mouth feel, keeping it light. Not long after launching this blog, I was fortunate to have my Japanese friend, Nami, from Just One Cookbook guest post before she hit super stardom. Here is her recipe for Japanese Purin, a no-bake version using gelatine. 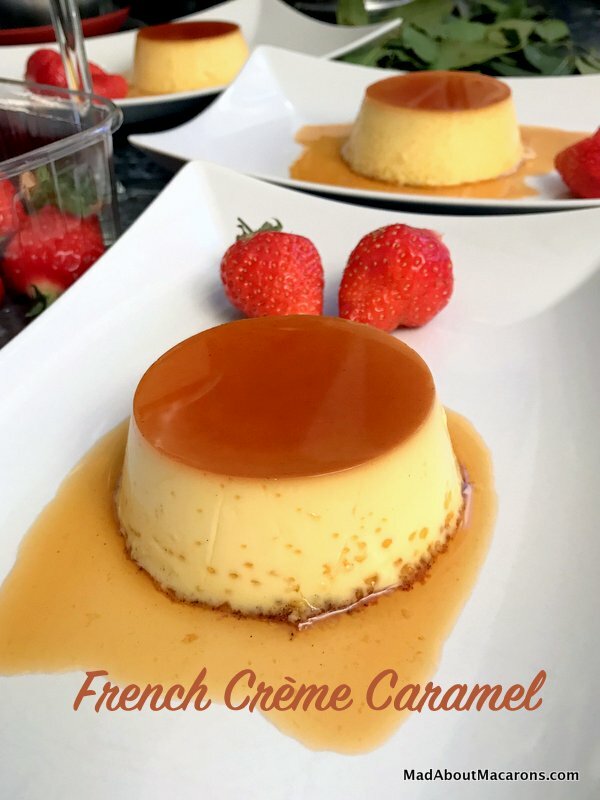 This French Crème Caramel recipe below does look long and complicated but I’ve given detailed recipe steps to explain how easy it is. Et voilà ! An easy, step by step recipe for the classic French Crème Caramel. No cream but made with egg yolks for a light, melt-in-the-mouth perfect end to any meal. Pour the caramel into 4 ramekin dishes, ensuring that it coats completely the base. Set aside to cool so that the caramel sets and immediately put the saucepan in the sink and soak in water, making it easier to clean later. Preheat the oven to 170°C/340°F/150°C fan/Gas 3. Pour the milk into a medium saucepan, adding the vanilla and just allow the milk to heat to simmering point (not boiling). Take off the heat. Whisk the eggs, yolks and sugar in a large bowl. Pour in the hot milk and whisk constantly. Put the ramekins into a roasting tin and pour in the custard mix over the caramel. Place in the oven and pour in warm water into the roasting tin so that it comes to about 2/3 of the way up the ramekins. Bake for about 40 minutes or until set (they're not cooked properly if there's a dip in the middle). Remove from the oven carefully, and gradually remove the ramekins onto a cooling rack. When cool, transfer to the fridge and chill for at least 2 hours - or overnight. To serve, slice through a cross in the middle of each ramekin with a thin sharp knife and loosen the creams by running the knife also around the sides. Turn upside down directly on to the serving plates. Or just serve them directly in their ramekins, as many Parisian brasseries do! Best served at room temperature. Serve with fresh berries or slices of exotic fruits, depending on the season. Tip: To release the crème caramels from their ramekins, my Dad explained "as an engineer" that it was easier to slice a cross through the middle. Since then, I've always used this method, and find there's no need to grease the ramekins. However, if you prefer to grease them with butter, do so just before pouring in the custard. Have you made any of the recipes from le blog (from my books, too) or fancy making this classic French Crème Caramel? Please leave some comment love below, take a picture and hashtag it #MadAboutMacarons on Instagram and Facebook – or simply tell family and friends about le blog! Thanks so much for sharing. Never Miss a Recipe or Article! Bring some sunshine to the winter table and start your party with this salty sweet fun apéritif! The perfect partner to put out a Corsican cheese fire.